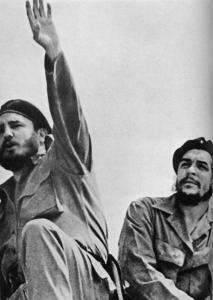 Fidel Castro (left) discusses Che Guevara (right) and many other people and topics in his 700-plus-page autobiography. Depending on your point of view, Cuban president Fidel Castro, who resigned this week, was either a dictatorial pariah or an underdog who has protected his nation from US imperialist aggression for half a century. "My Life" is Castro in his own words, "a spoken autobiography" told to journalist Ignacio Ramonet, who spent more than 100 hours with Castro. If the pure heft of "My Life" (700-plus pages) is any indication, Ramonet has included every minute of his conversations with Castro. The book is organized as a series of chapters formatted as question and answers, and it follows the chronology of Castro's life, including his boyhood, his education as a Marxist, his role in the Cuban revolution, and his difficult relationship with the United States. Ramonet clearly admires the octogenarian Castro, as his less-than-critical interviewing style reveals. "Seeing Fidel Castro in action is inspiring," Ramonet says. He's "always full of ideas, thinking the unthinkable. . . . He is incapable of having an idea that's not a Big Idea, and his mental daring is spectacular." Castro, like any world leader, is supremely conscious of his public reputation. When this concern is coupled with an interviewer of unmistakable sympathy (which may explain Ramonet's unprecedented access), a chronicle containing burnishing, polishing, and selective memory should come as no surprise. Castro consistently used the serious threat of US intervention to help build loyalty to his leadership. He says that Cuba "has been the object of the most prolonged economic war in history, and of a fierce and unceasing campaign of terrorism which has lasted more than forty-five years." The Kennedy administration was especially challenging for Castro, sponsoring the failed Bay of Pigs invasion, in 1961, and then compelling the Soviets to remove nuclear missiles from Cuba a year later. "No country has faced any adversary so powerful, so rich . . . and we never wavered," notes Castro. Behind Castro's predictable anti-Americanism, there are some surprises. When Soviet leader Nikita Khrushchev made an agreement with President Kennedy during the Cuban missile crisis, "Khrushchev didn't consult with us," says an indignant Castro, "and it had never been discussed with us in any way!" Castro also admits that he developed some of his guerilla-warfare techniques from reading Ernest Hemingway: " 'For Whom the Bell Tolls' allowed us to actually see [the experience of guerrilla warfare]. . . . Hemingway describes things in a very realistic way." Castro also discusses fellow revolutionary Che Guevara. The two were comrades in arms, but Castro recognized that Guevara could be dangerously impulsive: "He was characterized by an extraordinary bravery, an absolute contempt for danger, but also, he'd sometimes propose that we do very difficult, very risky things." During Castro's successful guerilla campaign against US-backed Cuban dictator Fulgencio Batista, he began growing his beard as a gesture of solidarity: "When we found ourselves in the middle of the wilderness . . . everybody just let their beards and hair grow, and that turned into a kind of badge of identity." Castro would overthrow Batista in 1959; the beard remained. Castro clearly loves to talk, but not all of this material (the book was originally published in Spain) will resonate with American readers. We get dry chapters on Cuba's relationships with Spain and France, and chapters titled "The Ochoa Case and the Death Penalty" and "The Arrest of Dissidents in March 2003." Even Castro's take on his crucial, negative relationship with the United States contains scant revelations. "My Life" is a long book by a consummate survivor looking back over eight decades. Though it will appeal to anyone fascinated with Castro, the general reader may want something more balanced, concise, and accessible.